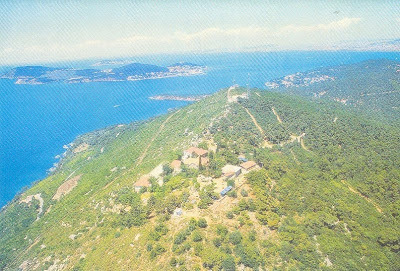 This historic Monastery of Saint George Koudounas, on Prince's Island outside of Constantinople, was according to tradition built by the Byzantine Emperor Nikephoros Phokas in 963 AD. A miraculous icon of St. George was brought here from the Monastery of Peace, which was founded by Emperor Justin II, in Athens at that time. The Monastery was later sacked in the Fourth Crusade. Then in 1302 the pirate Giustiniani plundered all the buildings and monasteries of the island. Not wanting their holy icon stolen by the Franks, the monks hid the icon under the earth and place the holy altar above it. 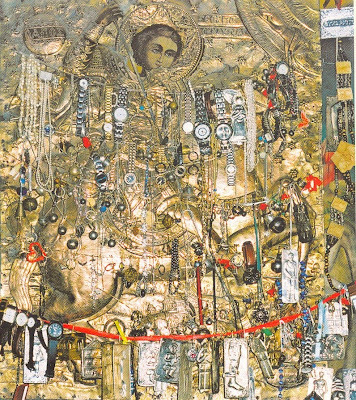 The miraculous icon however was lost for many years. Later, St. George appeared to a shepherd in a dream and told him where to find his icon. 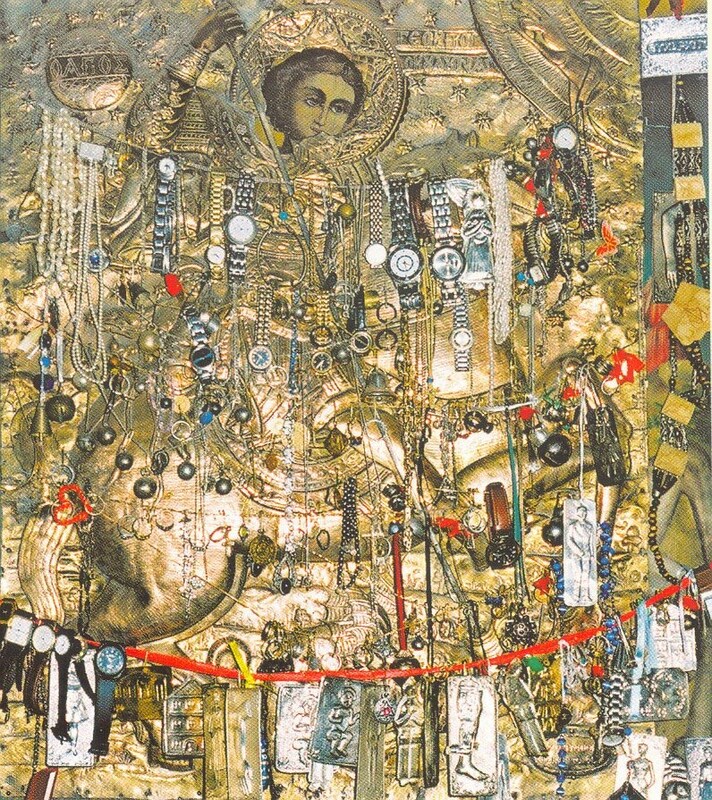 When he approached the area, he heard the ringing of bells, and having unearthed the icon, found it decorated with bells. This is the source behind the epithet "Koudouna" which means "bells". The Monastery was later attached to Hagia Lavra in Kalavryta, and eventually to the Patriarch of Constantinople. The current church was built in 1905. The miracles of the Saint are many, not only towards Christians [Romans], who approached always with great reverence (in olden times there wasn't a Christian family which had not visited Koudouna at least once a year), but towards everyone without exception, who approach his grace with faith. Thus there is a great mass of people who come from other faiths from throughout Turkey. The pilgrims number about 250,000 a year, the majority being Turks. The great iron gate of the Monastery, as we learn from its engraving in Greek and Turkish, was offered from the Muslim Rasoul Efenti, as a gift of gratitude towards the Saint for the healing of his wife. On April 23rd, in other words the day when the Saint is honored and the Monastery celebrates, tens of thousands of pilgrims arrive, not only from Constantinople but from other cities, to venerate the Great Martyr and to seek help in their problems. Roughly all of these pilgrims are from other faiths. Many will return later to thank St. George, who heard their prayer and granted their desire, bringing the indispensable oil for his vigil lamp. You hear with passion how he healed this person's son, how another became a mother after being barren for many years, how a third acquired a house, etc. The Monastery also celebrates on the feast of Saint Thekla, and on this feast about 10,000 Muslims visit the Monastery seeking the prayer of Saint George. Some come barefoot up the hill which takes about 30 minutes to climb to the Monastery, others come with offerings of oil, candles, and sugar so that their lives may be sweet. Some do not speak as they climb up to the Monastery until they kiss the icon of St. George. They follow the services with hands lifted in the air holding lit candles. They ask priests for antidron to bring home with them for a blessing. They have great faith and respect for Orthodoxy. On September 24 I witnessed at 6:00 AM four modern looking Turkish girls approaching the Monastery. I asked them for what purpose they came. They responded: "Faith in the Saint brought us here. It doesn't matter that we are Muslims. We prayed that he would help us. We have heard so much about the Monastery." Oral came from Smyrna in order to venerate the Saint with her vow. She brought three bottles of oil. When I asked why she, as a Muslim woman among the thousands, visit the Orthodox Monastery, she responded: "It is not forbidden by anyone for us to believe in Saint George. Religions have one common agreement, the one and only God. We could be hiding within us a christian." Of the many interviews I conducted that day with Muslims, the responses were basically the same. A different answer was given by Antil however. He said: "Life in Turkey is difficult. The people need something to give them strength. They have turned to religion. They have been bored by everything so they seek help elsewhere. Why not Saint George?" And one Turkish newspaper reported: "Saint George has distributed hope to the suffering." Hieromonk Ephraim of Xenophontos, who has lived for three years at “Koudouna”, is astonished with the faith of the thousands of Muslims who visit the monastery. "These people live with their heart", he affirms, "Because faith is the sight and the strength of the heart, for this reason they can and they do experience our Saints." Monk Kallinikos of Xenophontos, who serves as a priest, relates: "We are astonished with that which occurs here. Many times we see people who find the Lord with the faith of the Roman centurion." To our question if the Saint responds to the supplications of the thousands of pilgrims, he replied: "During my three years here, we ourselves are witnesses of miracles, such as the healing of paralytics, mutes, and the giving birth to children." We asked the monks at St. George to comment about their stay in Turkey, and they told us: "All of their behavior is perfect. From the highest ruler, to the lowest, they treat us with such respect that many times we wonder which would be better, to live in Christian Greece or Muslim Turkey. We should tell you that we go everywhere with the monastic dress and our experiences have always been positive. Thus, St. George has become a place of worship for thousands of atheists, Christians, Jews, and especially Muslims, who with every means come to the island and bring their tamata (vows), and place them before the Saint, as they place their hopes in him. And the Saint shows that he does not judge and 'imparts healing' to every faithful person." A Turkish woman from Levkochori had a serious health problem. She had heard a lot about St. George and wanted to come [venerate], but they did not let her come into the church because she was Turkish. But this didn't deter her from remaining outside the church the whole night. In the morning they gave her holy oil from the vigil lamp of the Saint and she became well. After this, her husband gave many gifts to the church. A Muslim woman with her mother were taking a taxi for a long trip. The Muslims, as is well known, respect St. George very much. Note: These and similar miracles and sentiments do not at all vindicate the false religion of Islam, nor the terrible actions of some Turks against Christians, but the faith and love of some simple Muslims towards Christ and His Saints. Similarly, Christ found in the Roman Centurion greater faith than any in Israel (Matthew 8:10). And often, this presence of the Holy Spirit out of love not only acts to heal the bodies of non-Orthodox, but more crucially the souls, as many later embrace the light and are baptized Orthodox. May Christ grant us all repentance, that we all may be saved, and come to the knowledge of the Truth. St. George the Trophy-bearer, intercede for us all and help us! Amen. More can be read here about Muslims at Koudouna. Why Do Muslims Venerate Saint George? According to Archimandrite Damianos, overseer of the Holy Sepulchre, there are three reasons: "1. His green garments, which for Muslims represents "life" and for which reason they call him "the Green One"; 2. Because many Muslims hear about and experience his miracles; 3. Because as a Trophy-bearer with a cape and sword he inspires a certain amount of fear and respect." It is because of the great respect for St. George that none of the Orthodox churches dedicated to him in Turkey have been demolished, as well as churches dedicated to the Theotokos who also is greatly respected by Muslims.